Offers a study on 'complementary protection' - the protection afforded by States to persons who need international protection but fall outside the legal definition of a refugee in article 1A(2) of the 1951 Refugee Convention. This book also provides an analysis of complementary p... read full description below. This book represents an exciting new contribution to the field of refugee law and human rights law. It considers the legal obligations which countries have to people who do not meet the legal definition of a 'refugee', but who have nonetheless been forcibly displaced from their homes, whether due to war, generalized violence, humanitarian disaster or torture, inhuman or degrading treatment or punishment. This is known as 'complementary protection', because it complements the central international instrument in this area, the 1951 Refugee Convention. The book analyses international human rights law to discern where such legal obligations to protect might arise, and considers the legal status which countries ought to provide to such people. It provides a comprehensive overview of States' current responses to this issue, and offers original and thoughtful suggestions for protecting such persons within the international legal framework. 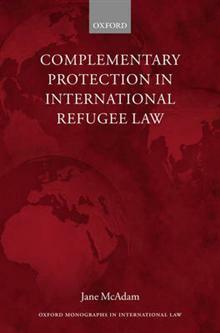 This book is the first dedicated study on 'complementary protection' - the protection afforded by States to persons who need international protection but fall outside the legal definition of a refugee in article 1A(2) of the 1951 Refugee Convention. Human rights law has extended States' international protection obligations beyond the Refugee Convention, preventing States from removing individuals who would be at risk of serious harm if returned to their countries of origin. While a number of States have traditionally respected these additional human rights obligations, they have been reluctant to grant beneficiaries a formal legal status analogous to that enjoyed by Convention refugees. This book provides a comprehensive analysis of complementary protection, from its historical development through to its contemporary application. 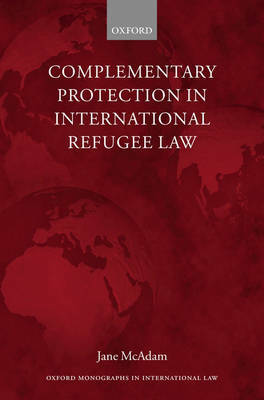 By examining the human rights foundations of the Convention, the architecture of Convention rights, regional examples of complementary protection, and principles of non-discrimination, the book argues that the Convention acts as a type of lex specialis for persons in need of international protection, providing a specialized blueprint for legal status, irrespective of the legal source of the protection obligation. Chapter 1 identifies pre-1951 examples of complementary protection, demonstrating how the content of the status afforded to extended categories of refugees was historically the same as that granted to 'legal' refugees. It traces unsuccessful attempts at the international and European levels to codify a system of complementary protection, prior to the EU's adoption of the Qualification Directive in 2004 and international support for an ExCom Conclusion in 2005. The Qualification Directive, examined in Chapter 2, represents the first supranational codification of complementary protection, but is hampered by a hierarchical conceptualization of protection that grants a lesser status to beneficiaries of 'subsidiary protection' vis-a-vis Convention refugees. Chapters 3 to 5 examine a number of human rights treaties (CAT, ECHR, ICCPR and CRC) to identify provisions which may give rise to a claim for international protection. Finally, Chapter 6 illustrates why all persons protected by the principle of non-refoulement should be entitled to the same legal status as refugees, demonstrating the Refugee Convention's role in providing a rights blueprint for beneficiaries of complementary protection. Dr Jane McAdam is a lecturer in law at the University of Sydney. Prior to assuming that appointment in 2005, she held a law lectureship at Lincoln College, University of Oxford, where she undertook her doctorate on complementary protection in international refugee law. Dr McAdam is the co-author with Dr Guy S Goodwin-Gill of the forthcoming third edition of The Refugee in International Law (OUP Oxford 2006), and has published widely in the areas of international human rights law, refugee law and history. She has worked on a variety of projects with UNHCR, the European Union, the Czech-Helsinki Committee, Amnesty International, the Refugee Council of Australia and the Refugee Studies Centre at the University of Oxford. She is the former General Editor of the Oxford University Commonwealth Law Journal and is currently a member of the Editorial Board of the Sydney Law Review. She is also a member of the Management Committee of the Refugee Advice and Casework Service in Sydney.